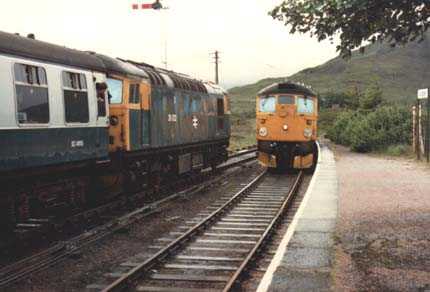 Class 26 locomotives tended to be concentrated in the north of Scotland. For many years they worked passenger and freight trains to the far north along mainly single line routes with passing places which allowed trains to cross each other. One such location was Achnasheen and below 26032 has been waiting for 26024 to arrive. 29th June 1983. 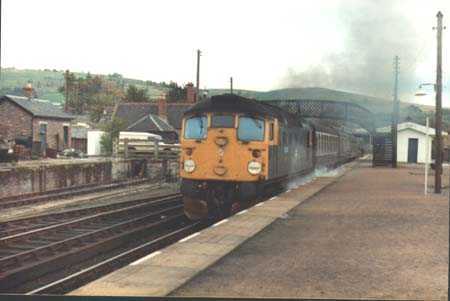 Next, 26034 makes quite a fuss as it storms away from Dingwall on 9th October 1982. 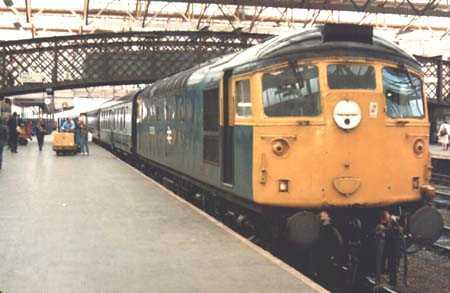 Occasionally a Scottish type 2 would work into England, usually to Carlisle or Newcastle. One means of achieving this was on Glasgow to Carlisle services on which 26036 was in action on 1st July 1983 and is seen (below) having arrived at Carlisle.